Is it academic that Donaire is running from Rigondeaux? By Chris Williams: Boxing fans want to see two time world champion Nonito Donaire to step up to the table and face WBA World super bantamweight champion Guillermo Rigondeaux (9-0, 7 KO’s) but Donaire is stubbornly resisting the fan pressure; instead marching by the beat of a different drummer and is looking for arguably softer targets, such as Wilfredo Vazquez Jr., who Donaire faces on February 4th for the vacant WBO super bantamweight strap in San Antonio, Texas. For the fans who don’t remember Vazquez Jr., he’s the guy that got pummeled by Jorge Arce last year in a 12th round TKO. So Donaire is okay with fighting a guy that was just knocked out but not too interested in fighting Rigondeaux, who just picked up the WBA title with a nice win over Rico Ramos. Donaire doesn’t seem to realize that no one wants to see him fight Vazquez Jr., and there’s a huge demand to see him fight Arce either. Arce probably isn’t going to be fighting too much longer anyway, so it’s not as if Donaire is facing a prime Arce. Boxing fans want to see what Donaire would do against the counter punching southpaw Rigondeaux. So why isn’t Donaire interested in taking that fight? It’s only going to get worse for him if he chooses to ignore him because Rigondeaux will continue to whip the top fighters in the super bantamweight division and if Donaire is fighting guys that boxing fans don’t care about, it’ll just make it seem all the more blatant that Donaire is running from Rigondeaux. I think Donaire has finally seen someone that he can’t beat and he doesn’t want any part of the guy. Rigondeaux eats up guys like Donaire and always has. Can you imagine what Rigondeaux would do to Donaire if he tried to load up with one of his big right hooks against him? Rigondeaux would block it and come straight to the midsection with a powerful left hand that would have Donaire rolling around on the canvas in pain trying to catch his breath. 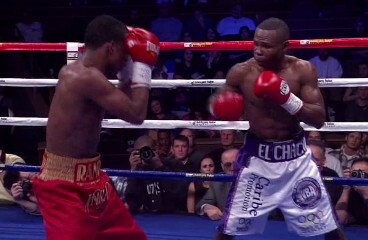 Boxing » Guillermo Rigondeaux » Is it academic that Donaire is running from Rigondeaux?